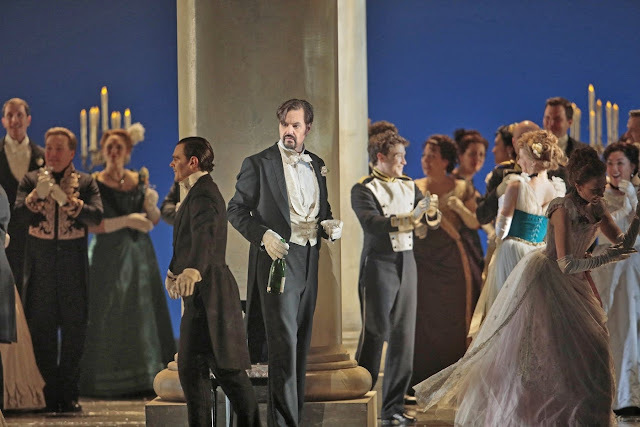 Today was the Metropolitan Opera Live in HD presentation of Tchaikovsky's Eugene Onegin starring Mattei and Netrebko. This was the third HD presentation of this opera and the second of this production. I had no sense that I was seeing a repeat. This time the production seemed perfect. The first two acts are clearly in a country villa with villagers and land owners. Larina, Lensky, Olga, Tatiana and Onegin represent the latter. Every role was cast to perfection. Tony Stevenson did a star turn singing the couplets at Tatiana's birthday party. Larissa Diadkova is very attentive as Tatiana's nanny. Olga and her mother were wonderfully sung by the two Elenas. Alexey Dolgov as Lensky was perfection as the too immature man who simply assumes Olga is his forever and does not know what to do when Onegin flirts with her. We will have to read the novel if we want to know what happens to Olga. Stefan Kocán seems a little young for Gremin but sang beautifully. 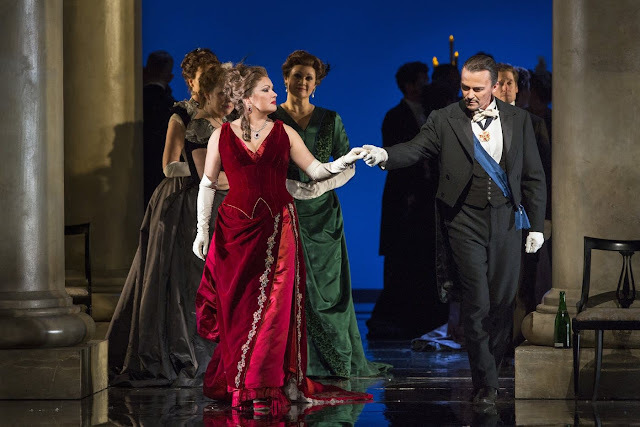 But it is the amazing acting of Anna Netrebko and Peter Mattei that brings this opera thrillingly to life. Anna has gone deeper into the character this time with astounding results. Peter portrays arrogance and ennui better than any of his predecessors, and then caps his performance with an intense finish. Here he appears at a party in St. Petersburg in the third act. It is an opera about love. I often think that I am happier in my old age because I no longer feel inclined to fall in love. It is far better to watch others suffer at the opera. This performance was a level of theatrical and musical achievement that comes only rarely. Bravi. Renée Fleming was our hostess. In two weeks we will see her in Der Rosenkavalier. We hope that isn't the last time we see her. I just like to say one thing about Gremin. At the end of opera is Onegin 26, [this is in the dialog.] Tatyana let's say 20-22 (?) and Gremin is around/after 30. That means the staging of the MET didn't felt short! ...but totally in accordance with Pushkin and Tchaikovsky potrayed Gremin as an adult ( not anymore boy) man with an war experience."